Normal service will be resumed when it's sensible to go out! UK readers will have been regaled on radio and TV about how Norfolk had the most snow dumped on us in the last two days. I see that the rest of the country will be getting their share later in the week. With the temperature outside still at -10ºC at 9am it's unlikely that we will be making a trip to the Post Office today to post orders and collect incoming. The PO is closed this afternoon anyway. I've been told of somebody who took 4 hours yesterday afternoon to make what is normally a 20 minute journey home. And he left early! Articulated lorries have no traction on lightweight cabs. Meanwhile here is a picture taken Monday evening to make you feel as cool as we are! Good to see that the feathered friends are getting fed. 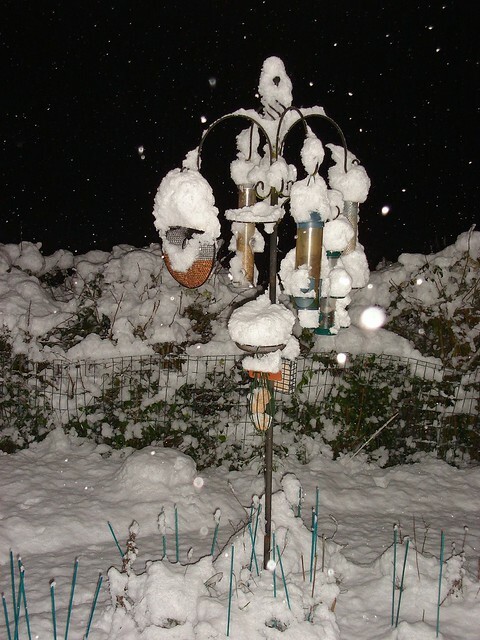 I've just erected a feeding station just like that, but mine didn't come with as much snow !!!! Maybe that will come under seperate cover later in the week !!!!!! It took me 3.25 hours to travel 23 miles and that was on the main bypass dual carriageway around Norwich it was like an ice skating rink. And not much better in places today. Yet when I arrive in Gt Yarmouth 5 miles from my location yesterday NO SNOW. I have been told, on good authority, that the lack of traction on lorries and buses is usually caused by automatic transmissions becoming 'confused' by the slippery conditions.